Prepare two glasses that water-filled balloons can be suspended in whilst in freezer. Have at hand two sturdy skewers or chopsticks to tie balloons to and to suspend over each glass. Take one balloon, open the neck and slide it over the kitchen tap. Slowly turn on the water flow and fill the balloon with enough water to make a small sphere (to fit into a martini glass or glass you’ve chosen). Tie the balloon to the chopstick, suspend it over the glass, and repeat. Place glasses with balloons in freezer overnight. Pulse fresh blackberries and Squeezed Blackcurrant fruit cordial a few times, so there is still texture. Place one tablespoon of blackcurrant mixture in the base of each martini glass. Take frozen balloons out of freezer. Run under a tap for a few seconds, then cut and peel away balloon. Discard balloon and place ice-sphere in the martini glass on top of blackcurrant mixture. 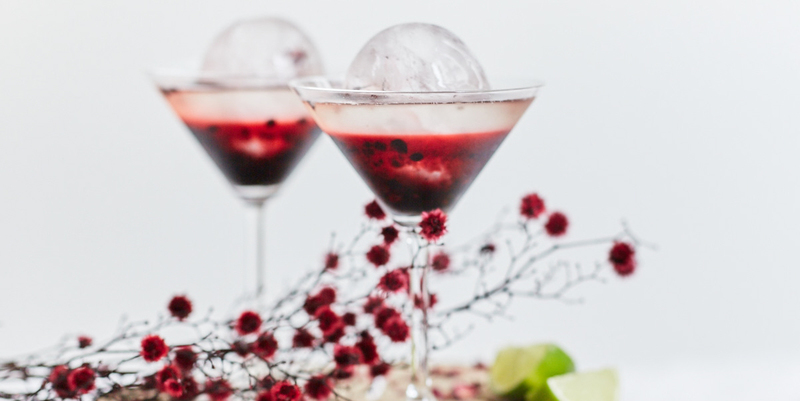 To mix, simply turn ice-sphere around in glass so blackcurrant mixture mixes with Champagne or Prosecco.